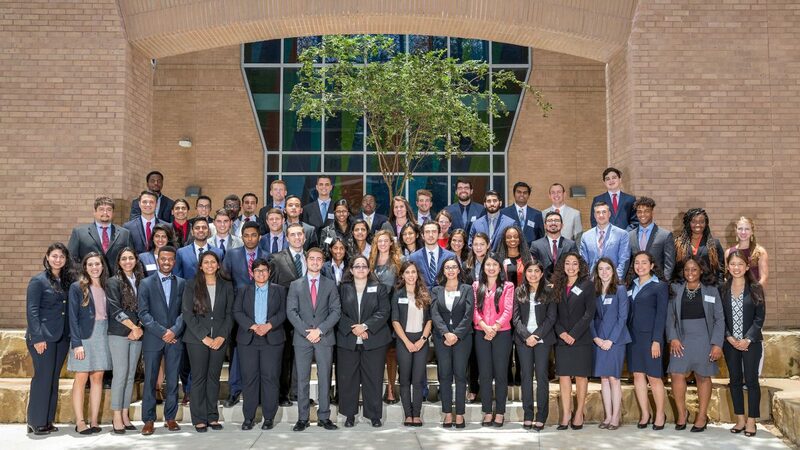 The UTRGV School of Medicine's third cohort class photo on Monday, July 9, 2018 at the Medical Education Building in Edinburg. EDINBURG — This week marked the first step toward a medical degree for 56 students who are starting their journey at the University of Texas Rio Grande Valley School of Medicine. This is UTRGV’s third class of medical students, which will be set for graduation by 2022 and for which orientation began this week. The latest crop of students were selected from among 4,100 and out of 360 interviewees. The group is made up of 52 Texas natives, including 14 students from the Valley, and four out-of-state students, the release states. The institutions where these students come from include Baylor, Duke, UT Austin, Emory, Rice, Stanford, Texas A&M and Vanderbilt, among others. “One of the School of Medicine’s key priorities is to contribute to the education, recruitment and retention of physicians in the Valley and the rural communities of South Texas,” the release states, adding that even those that come from out of state have strong ties to the Valley. The university welcomed its inaugural class made up of 55 students in July 2016, which is set to graduate in 2020, and the second cohort of 50 students in 2017. UTRGV officials have long emphasized the need to find candidates who have ties to the area or a desire to learn and practice in an underserved community such as the Valley. According to the press release, the demographics of the Class of 2022 are 28 percent Hispanic, 26 percent Asian and Asian Indian, 17 percent African American and 30 percent white or Caucasian, which would equal about 16 Hispanic students, 14 of Asian or Asian Indian decent, 9 African American and 17 white or Caucasian. This class has an average Medical College Admission Test, or MCAT, score in the 74th percentile nationwide, the release states, as well as a grade point average of 3.5 and an average BCPM — biology, chemistry, physics and math — grade point average of 3.4. The students will be culminating their orientation with a White Coat Ceremony at the end of July, which is set to mark the kickoff of their four-year learning period in the Valley.